Pure Essence Lab Transitions is a natural, vegetarian supplement that reduces hormonal imbalance (by way of ingredients like hesperidin and isoflavones) and also addresses the weaknesses that lead to it by strengthening the adrenal glands. It reduces menopausal symptoms like hot flashes, mood swings, weakness, loss of bone density, moodiness, anxiety, sleeplessness, and vaginal atrophy. Hesperidin – Prevents bone loss in menopausal women. Burdock root – Purifies blood and regulates hormonal imbalance. Chaste tree fruit – Balances estrogen and progesterone levels and reduces symptoms like hot flashes, night sweats, etc. Kudzu root – Contains isoflavones that support hormone balance and reduce menopause symptoms. Gamma oryzanol – Maintains healthy hormone levels. Motherwort – Reduces mood swings and irritability. Also keeps the heart healthy. Dong quai root – Reduces menopause symptoms and also alleviates pain associated with menopause and menstrual cycles. Black cohosh – Contains phytoestrogen and reduces menopause symptoms like hot flashes, night sweats, nervousness and irritability. Eleuthero root – Keeps the adrenal glands healthy and regulates hormone levels. Reduces common symptoms of menopause and is also beneficial for all major organ systems in the body. Poria cocos – Enhances mood and strengthens cardiac system. Wild yam root – Contains diosgenin, an estrogen precursor, which reduces hot flashes and regulates hormone levels. Rehmannia root – Kidney tonic that purifies the blood and regulates removal of hormones from the body. White peony root – Restores hormone balance and purifies blood. Suggested dosage is 2 capsules a day, one in the morning and one at night. For a 60 capsule bottle, the listed price is $38.44, but most third party websites sell it for a discounted price of $24.99. This supplement is made in adherence to GMP practises, but does not come with any money-back or refund guarantee. Is Pure Essence Lab Transitions Worth Buying? This is a good, natural supplement with several active ingredients, most of which are commonly used in menopause supplements. The only negative for this product is that it does not have a company guarantee backing it and so if it does not work for you, you cannot return it and get a refund. 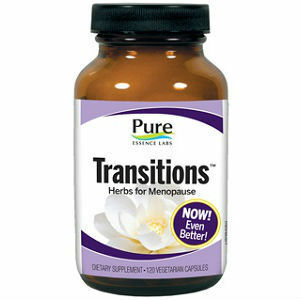 Jackie Horowitz	reviewed Pure Essence Labs Transitions	on February 6th	 and gave it a rating of 2.5.